Rousing the audience's curiosity, the painting invariably surprised viewers when exhibited as part of Gottfried Helnwein's retrospective exhibition held at the State Russian Museum in St. Petersburg. "Kindskopf (Head of a Child)" caused the audience to question whether the work was actually a painting or a photograph. Such reactions were typical among the audience, reflecting their naivety. Helnwein's portrait photograph subjects are celebrities from newspapers, magazines, TV and movies, and show no difference from other photographs taken of the same individuals. Through his photographs, Helnwein seems to confirm already fixed stereotypes. In collection form, his photographs seem to form a visual series of work. The same applies to his famous reproduction of composition, such as that of Andy Warhol's work; Helnwein effectively breathes new life into familiar works and reproduces them. 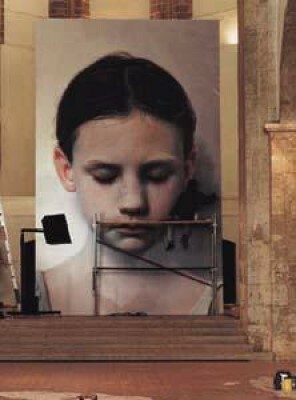 Gottfried Helnwein is endowed with perfect pitch and distinguished sense of contemporary issues. As a painter whose art deals with issues confronting human society, Helnwein creates a new standard of measuring modernism.